This is a heads up that Annatar and Bob K have played their series and recorded the videos. I have the videos and plan to do a livestream commentary as I watch them (I have not watched anything). Only issue is I don't know EXACTLY when as I need anywhere from 45min to an hour and a half where I am free to yell into a mic and be uninterrupted. I'll find a window and try to give people a heads up so they can watch together live. I will also record anyway, and post on YouTube. Looking forward to trying this for the first time, hopefully it's fun. Just know I'm working on it, and don't bug @annatar or @Bob Kudelski, they played! Good points @smozoma, I enjoy using graphics from the game and whipped this up. I like the scoreboard concept, but I am sure I can enlarge the actual game screen and rearrange a few things quickly. Little correction though - It’s actually the conference finals. Favorite Way To Score:With a firm backhand. Sorry for late notice, but I am going to do this around 4:00 est. I'll also record and post for viewing after. I think you can "highlight" the entire thing so it saves it forever? You were asking why @annatar put in Jimmy Carson for Gretzky. I think it's because Carson is actually a top player in SNES. He weighs 212, with 85 shot accuracy, and 65 shot power. Gretzky is too light, and has no shot at all. You'd have to ask annatar why Carson over Sandstrom at center. Maybe he prefers a right handed shot at center, and there's not much to separate the two players, other than bit harder shot from Sandstrom. LA #23 is in fact corey millen. You asked why I put in Juneau at center on the PK, after Neely got a penalty. Usually I wouldn't bother to sub out the auto-sub (Dave Poulin). But for this series, I knew for sure I didn't want Poulin in there. In retrospect, I guess I could have moved Oates over to C, so I would have had Ruczika (LW) and Oates (C) out there on the PK. Will keep this in mind for the future. I can't believe how many goals Sandstrom scored in the same fashion - by cutting in off the wing and going far side (at least 3 or 4). I saw it coming every time and couldn't get the goalie over in time. Annatar really exploited that. 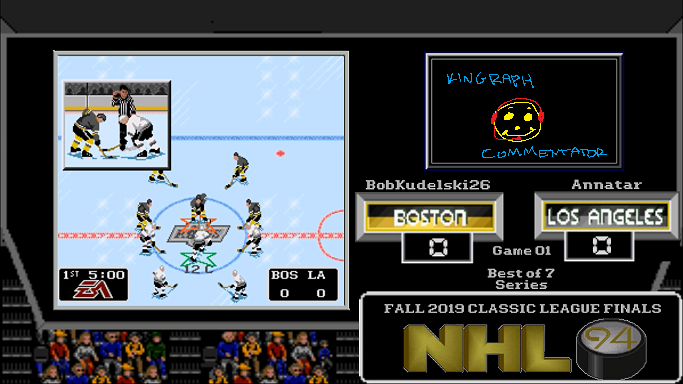 As with most SNES games and series, there were a few missed opportunities that could have drastically altered the course of the series - like a shot sailing over an open net, or a non-call on a breakaway bodycheck. I was very fortunate to take this series in only 5 games. @kingraph If you have an Amazon Prime account, you can make the channel "Prime" as well which extends the length of time broadcasts stay up there. @smozoma is correct that you can create a full highlight, which would preserve any comments made at their appropriate timestamps. I would think with Sandstrom and Robi that LA had enough shot, and frankly Bourque is taking out anyone near him whether it's Carson or Gretzky. Was thinking at some point Gretzky's agility and stick may make an appearance to try and escape those Bruins! I feel happy I knew it was Millen, lol. This definitely was fun to do, and I would love to try it again in the future. @Edge of 94' WI has also introduced me to a way in which we can have two people doing commentary, so that is something to keep in mind for the future...maybe even an "interview" style with a player watching his own series!? So I can scream at you live WHY U SUB JUNEAU? Of it's it's Annatar, WHY U NO TIMEOUT? One thing I forgot to actually say was GGS (!!) to you and @annatar! It's hard to convey the skill level you guys play and try to get that across while watching live, but that was great. Definitely felt closer than 5 games, but ultimately I thought you had the upper hand this series. There were some major manual goalie saves that may have been the difference. QUESTION -- I noticed when I scanned back that Annatar DID pull his goalie at the end of game 04 (around 40:20 mark), but there was NO extra attacker? So strange, I never saw that before. Also, during that same sequence, the Boston bench was jumping and celebrating! I never noticed that before. Wow, it DOES look like LA didn't get the extra attacker there! I figured Hrudey was just taking his time skating to the bench and making the change.. But based on your embedded video, I only see 5 LA skaters! Weird. I think the Boston bench was cheering the Neely hit on Carson. And for what it's worth, I personally go with a lineup of Gretzky - Carson - Sandstrom. I know it's weird, but I don't like Robitaille. For some reason I just can't score with him. I find him slow and weak and his shot just doesn't work for me. Go figure. I do like your idea of the two person commentary with a player, or both players, watching their own series. I'd like to pretend that I'm some sort of streaming wizard, but it's actually quite simple. Within Discord, you can share your screen with another person during a voice or video call. The person recording(preferably the play by play person) makes the call. The audio is captured by OBS or whatever your preferred streaming software is. Make sure to use the full on Discord application on your PC, not the web page version. The person providing color commentary will be able to see everything that the streamer is seeing, however the audio outside of the voice call won't be heard by the color commentator. They have to take their cues from the play by play guy, and what they see on the screen. Here is an example of the Tecmo online series we did with varied color commentators. There are several games, all with different impact. I used editing software to mash all of these up, but a single broadcast can be done quite easily. Just wanted to say props to @kingraph for doing this. I haven't gotten around to watching it yet but I will soon just to relive all the frustration. Bob Kudelski deserves all the credit for getting the most out of Boston, I think it would have been a huge upset if I'd taken it cause lately he is playing better than I've ever seen. Respect! I often do put in Gretz on the LW if I feel my lineup isn't getting it done, but maybe I was just being stubborn or I actually liked the way my guys were playing. Just wasn't enough on the day. Millen is a brutal second line center especially when LA has so many other good depth guys (Kurri, Granato?) so it's probably worth being more careful with the roster to try to keep him off the ice. Again ggs @Bob Kudelski and I wish I could have taken it to 7 but at least all the games were close.